It is the teachers and the qualities they bring which make the real difference in any school. during preschool is important for the child’s life-long success. With a variety of experiences including both international living and teaching, our staff understand the stresses that international children face daily and help them make their first learning experience a fun and enjoyable time. YEP aims to develop in each child a positive attitude towards school and help them enjoy learning! YEP embraces the diversity of our world and we are unceasingly finding ways to broaden the perspectives of our students. Our commitment to diversity begins with our multi-national, bicultural staff. 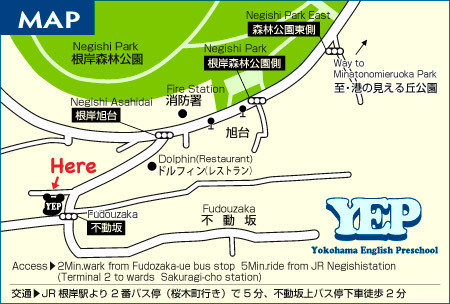 Our school is conveniently located in Negishi where it is easily by bus and by car. 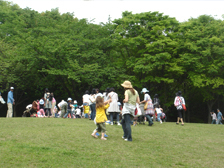 The neighborhood is teemed with foreign people and the school is near the Negishi Shinrin Park where the children can spend time playing whenever the weather is good. 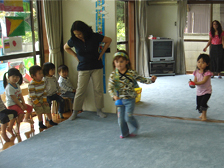 The classrooms in Yokohama English Preschool are all facing the open garden which makes the atmosphere inside the rooms very refreshing and fun of bliss. 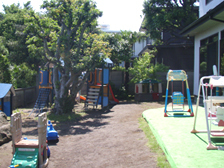 The garden has a nice open space where the children can run around. made up of toys from a well-known maker in Sweden.